This is RPG-ology #4: The Big Game, for March 2018. I’m going to begin by apologizing to the Christian Gamers Guild President, Reverend Rodney Barnes. It seems we often find ourselves arguing opposite ends of a question. Years ago (maybe decades) we both participated in the Magic Symposium in The Way, the Truth, and the Dice, and his contribution, Magic as Part of Creation, suggested handling the issue in exactly the way that my contribution, Magic: Essential to Faith, Essential to Fantasy, said was the wrong way. Now a year ago he wrote The Numbers Game, in which he suggested keeping a strict limit on the number of players in your game, and it seems that I am writing to contradict him once again. Let me say that this is not really my intention, and I do understand his point. When I run Multiverser games, even at conventions, I try to keep the game to four players at a time, and if it stretches beyond six I usually try to get someone at the table to work with me as a second referee to run some of the players. But E. R. Jones and I had the experience of being two of maybe half a dozen known Advanced Dungeons & Dragons™ Dungeon Masters in our small county, and when we ran the game the rule was always that anyone who wants to play is welcome at the table as long as someone already there will vouch for him. I sometimes ran thirty players in my living room/dining room; he sometimes ran fifty in cafeterias and snack shops. CGG President Rodney Barnes begins a series about how a Gamemaster can be a Servant to their roleplaying group. Too many personalities to handle? How big should your RPG group be? GMs also need to take on the role of actor. When heroes encounter villains, allies, or neutrals, they want for them to be interesting enough to be able to tell one from another. When the NPCs perform their heroic or dastardly deeds, they should remain feasibly consistent with what the players have already learned about them. The GM is also the host of the game. Whether the game is at the GM’s home or not, it is still the GM that is responsible for the game. When new players want to join, they should feel welcome so that they enjoy the experience and want to return — make them feel at home. Make sure they know where the bathroom is, and where the phone is. Offer to get them something to eat or drink if you notice that they aren’t digging in. Having enough chairs and table space makes it easier for the game to get going. 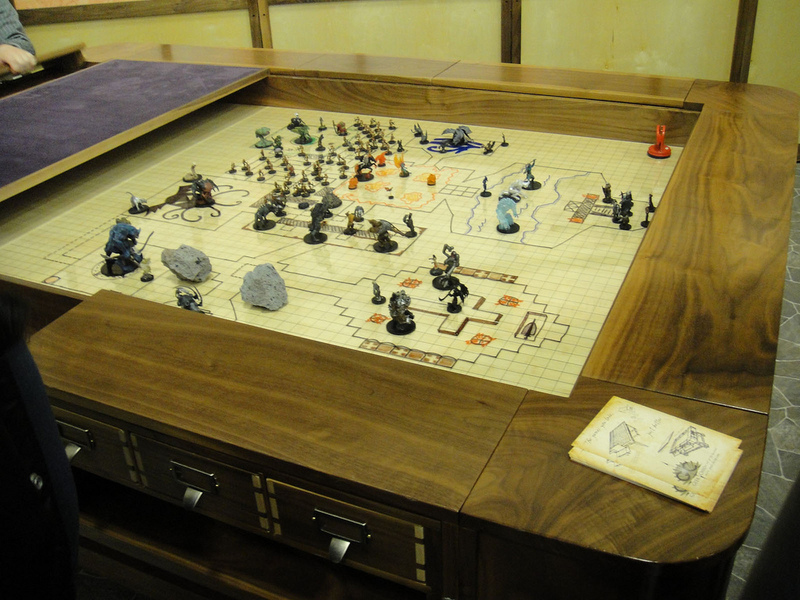 If the table is covered with boxes, papers, and dirty dishes, players might feel like intruders in the GM’s home, instead of the important guests that they are. GMs also have to act as referee/judge when running a game. In other games that require a referee (such as football), the referees must know the rules in and out, and be ready to make a call instantly. GMing is a little different, since the GM not only enforces the rules like other referees; he’s also free to change them to suit the story. Example: In one game, the GM had us write up Champions characters, but we may as well not have bothered. The game was run extremely freeform, and felt more like a Marvel Super Heroes game. My speedster had a 9 SPD, but in combat, it didnt matter at all, since everything was handled descriptively, instead of taking it phase by phase. This took some getting used to, but it was kind of nice to play Champions while taking a break from the rules for a while. Example: In another game, I was mind-controlled to hate a demon that got stronger whenever he was attacked in hate. Since the mind control attack barely hit me, the GM offered me a chance to dodge. Surprised, I said, Okay, what do I do? He told me to roll the dice and tell him if I made it. I rolled 3d6 and got an average result, and told him that I guessed I made it. He told me that the mental beam just snagged me in the foot as I was getting out of the way and that I now had a medium dislike of the demon. This was a nice rule-bending that added a partial effect to mind control, which is normally all-or-nothing. I ended up attacking a structure behind him so that it collapsed and knocked him out. A good GM also acts as writer, whether he has written the stories himself or not. The situation is similar to a playwright who has created a script, yet has to endure the directors differing interpretation, the casting director’s questionable role assignments, and the actor’ mediocre performances. The end result of all this is often quite different from what the writer had in mind originally, but given good people, the resulting play can be greater than its original manuscript. Writing a game scenario is different than writing a book or a play. The characters involved get to change the script as they go. It’s similar to improvisational theatre, in which the actors are (sometimes) given a topic, and they develop their own characters and plot as they go. A GM can start with a great story, but what happens when the players don’t do what the GM expects? The GM has the choice of giving the players complete freedom to do what they want and go where they want, or of railroading the players onto a predetermined path. Or, of course, something in between. A good GM finds the compromise that best suits his players and himself. This is not always easy to do. But not all GMs have the gift of quick thinking. Some rely on fluid scripting. For example, a GM might set up a crossroads for the characters, and want them to take the left fork so that they will gain the ally they need before they take the right fork to battle the enemy. But then the players insist on taking the right fork, so the GM ensures that the ally just happens to be traveling the right fork on the way to battle the enemy anyway, and the party is fortified even though they did not do what the GM expected. Example: In my Star Hero game, the heroes got caught in a hyperspace whirlpool, and got transported to a universe where magic works. There was a planet right in front of them when they emerged into the new dimension. As I had planned it, the planet was the inadvertent cause of the vortex, because it was drawing magical energy from hyperspace. My players found it odd that a planet was right there, and debated whether or not to explore it so they could possibly find a way back to their own universe. Eventually, they decided that even if they decided to go somewhere else to explore, whichever planet they landed on would end up being this Planet X which was in front of them, so they decided to land after all. I was relieved that they decided to land on it, since logically, no other planet would have been causing the whirlpool. I was a little insulted being thought of as a railroader, and if they had gone elsewhere, I would’ve had to probably postpone the session, since I had nothing else planned. But it all worked out in the end. Dave barely touched on the many writerly jobs the GM performs. Creating the plot is the cornerstone, of course, but there are characters to be developed and a world to build as well. In what other ways do the skills of a writer transfer to the craft of Game Mastery? This article was originally published in The Way, the Truth, & the Dice. Due to the original article’s length, it is being serialized for this format.